This recipe contains no wheat, but if you are sensitive to gluten check with your doctor and be sure you buy only rice and oatmeal that says it is gluten free since they may be cross contaminated. I have read conflicting things about whether or not they contain gluten. I am NOT gluten intolerant, I only seem to have a problem with wheat itself. Cream the sugars, shortening, butter, eggs, water and vanilla together. If you are adding raisins, mix them with the flour, salt and soda and stir until the raisins are coated (to keep them from sticking in a big clump). Then add to the sugar/shortening mixture and mix well. Finally stir in all of the oats (both the blended and the whole–just mix them all in) and blend well. I always cook my cookies on silicon baking mats or parchment paper, but if you don’t use those, grease your cookie sheet, just in case. There’s nothing worse than awesome cookies sticking to your cookie sheet! Then drop small balls onto the cookie sheets. They will SPREAD! Remember, because they have no wheat in them they aren’t going to puff up, they are going to be pretty flat. I’m sorry I forgot to take any photos of them before I baked them. But take my word for it, if you want big cookies, don’t put them close together. I didn’t realize when I made the first pan how much they would spread and they all fused. It was ok, we ate them anyway! Cook about 12 minutes. If you let them set a few minutes after you take them out of the oven they are easier to remove from the cookie sheet. Susie I will be trying these! I cut gluten from my diet a few weeks ago as an experiment and guess what? My migraines disappeared, along with a lot of digestive problems and other minor stuff. I’m hoping I continue to feel well, but for now I am gluten free. Trouble is, the tests for coeliac disease involve you eating gluten for a few weeks beforehand. In the UK, oats are assumed to contain gluten unless marked as gluten free – when they are about 5 x the price (maybe more!). Have you seen this recipe? – gorgeous cookies (nice blog too)! My OH groaned when I told him they were gluten free & he wasn’t going to try them, but he loves them. Thank you I will check that out, I bookmarked that page to try. And you know what? I read that a high percentage of people with Irish ancestry are gluten intolerant! I don’t know if that translates to people from the UK in general or not, but I actually have Irish ancestry! I don’t know if gluten is my problem or just wheat itself but if I don’t eat wheat my joints are fine, if I eat it I ache all over. Great recipe, a got to try, and Wendy’s too. I’ll need to convert ‘cup’ to ‘ounce’ but I can google a conversion chart easily enough. Thanks for the lovely comment on my blog… I have seen Spiderwick Chronicles and it’s a great film, I love that type of kids movie, much better than most ‘grown up’ movies. Who wants to grow up anyway? Thanks Jan. that makes me think that maybe I should find a conversion chart and post a link on my page somewhere. That would be handy since I have so many people from across the pond who do come here. I’ll check that out. Thank you for making me think about that. Thank you soo much for this recipe!! My friend eats gluten-free except doesn’t worry about the contamination of oats, and she’s pregnant so I wanted to make lactation cookies for her for when baby comes. I tried another recipe yesterday and it was an utter failure, I wa soo upset! But this recipe worked great!! My friend also doesn’t eat eggs, so I used a flaxseed egg substitute(ground flax and water). And to make them beneficial for lactation I added 1tsp fenugreek and 2-3tbsp brewers yeast – oats are also good for lactation. So, I you don’t mind I might share your recipe with my recommended additions for people wanting gluten free lactation cookies. I do not mind and all, and would love a link to your website. I believe recipes are to be shared and then made and added to or changed to suit ones needs and tastes. I am not sure where my original oatmeal cookie recipe came from (maybe my sister, she did give me some good ones when I first got married). I am also a big fan of breastfeeding babies. So anything that helps in that area makes me happy! 🙂 Thank you for stopping by! Don’t have a website actually, just shared a link with my recommended additions for lactation on a pro-breastfeeding Facebook page :). I gobbled up those cookies I made soo fast btw, they’re awesome!! Sorry for my extreme tardiness, and I hope you see this traci! 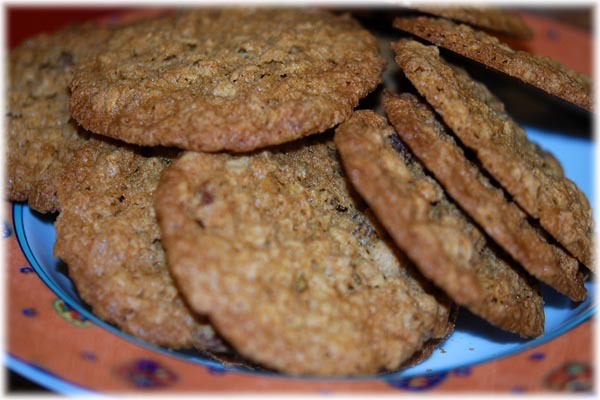 I haven’t tried them with anything else (the original oatmeal cookie recipe used shortening). My first thought would be butter, altho it might change the cookie somewhat. Oils would change the texture and you should use less. I did read that coconut oil can be substituted for butter or shortening in cookie recipes. If you see this and you do try it with a change I would LOVE to know. The recipe as I have it makes really nice crispy cookies. You might actually LIKE a different texture. Thank you for stopping by. I hope you come back.